Saudi-born artist Hend Al Mansour has long explored themes related to Arab female equality and the expression of women as full participants in contemporary society. Her newest project, Mihrab, is her most ambitious and comprehensive artistic endeavor yet, wherein she reveals private female spiritual practice as separate from male-dominated religious parameters. 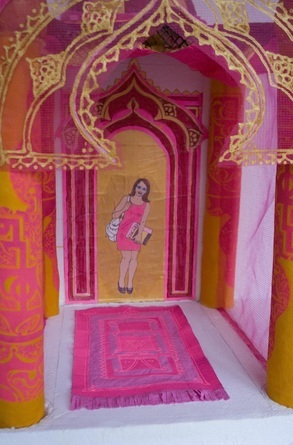 The artistic representations of Al Mansour’s subjects in the mihrabs is a radical reimagining of sacred space in the traditional religious sphere where women have been habitually marginalized. Al Mansour’s approach is to demonstrate that women have equal access to god, or the spirit, no matter what her religion or social traditions. “Women are taking that space in the world, talking to god through movements and prayer. They are in touch with the divine,” she said. Al Mansour’s ground-breaking way of thinking about mihrabs is to celebrate female power and portray her subject’s worldview as multifaceted and distinct. By interviewing contemporary Arab women and exploring their values, faith and aesthetics, and creating individual mihrabs based on their responses, Al Mansour is establishing a new social and artistic context for their lives. Al Mansour tells their stories in multi-dimensional art that contain elements that are traditional and trailblazing, as well as collaborative and individualistic in its expression. “There’s a complexity there,” she said, that she herself is addressing through the creative process, and by extension what she wants viewers to explore. Al Mansour goes beyond simply depicting each woman’s story to interpreting its meaning as the artist. Al Mansour’s mihrabs are meant to communicate and connect the dual tensions inherent in separating personal identity and artistic form and content. Through the thought-provoking and experiential medium of Al Mansour’s Mihrab project, viewers will be invited into each illuminated mihrab to hear recorded sounds and see imagery related to each woman’s identity and her reflections and rituals. “You may hear songs or the call to prayer and see things that are meaningful to each woman,” Al Mansour said. Every mihrab, or niche, will be nine feet tall covering an eight by ten foot floor space. Each sculptural composition has a dome and pillars made of wood, paper, and fabric, with an alcove that projects from a wall. All mihrabs will feature a unique painted prayer rug. Inside the mihrab will be a variety of small objects, inscribed poems, and other items that pay homage to each woman’s cultural heritage. Currently, three mihrabs have been created based on conversations with women who are Moroccan, Saudi Arabian and Syrian. Their mihrabs will be displayed as a pilot exhibition in January 2016 at the Corcordia College Art Center in St. Paul, Minn.